If you could talk to 20, 30, 50 people at a time, what would that do to your ability to find and close sales? Public speaking brings massive opportunities to reach a broader audience, creates powerful time leverage, and helps you develop a critical skill, clearly communicating your ideas to groups of prospective buyers. If you could schedule just one speech a week, what do you think that would do to your ability to prospect, find new contacts, and expand your territory? And what if it took less than 15 minutes a week to find and book that speech? Does this idea scare you a little? Good! It scares almost everyone, which means that only the courageous sales pros will use this strategy. Imagine how little competition you’ll face! I’ve been a full-time professional speaker since 1989 when I started my first publishing and training company. I deliver more than 60 speeches or training events a year. I started by doing 100 free speeches to local service clubs. Every service club in your community needs a speaker every week, so they are happy when they find out you have something interesting to say to their group. While you can’t directly pitch your product, you can educate the audience about what you do, how it makes their lives better, and invite them to spend time with you. 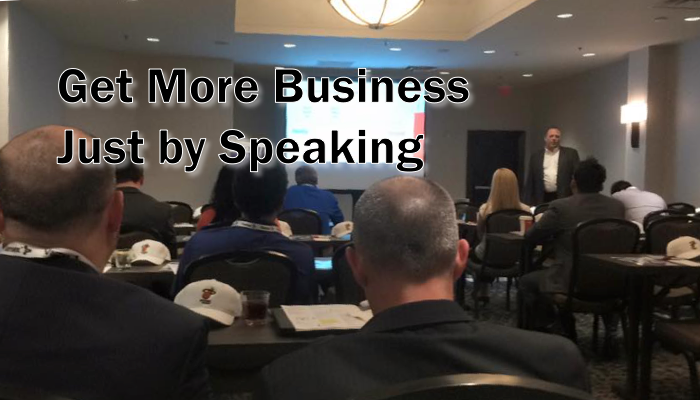 I recorded a 45-minute consulting session advising two insurance agents that details how to speak at local events to find new customers and get lots of speaking practice. My son, Harrison who introduces me on the recording, was five at the time. He’s now 26. Yet everything I reveal is still true and works perfectly. I’ve included the program outline, forms that I used to book the speeches, and follow up strategy after the event. This can seriously short cut the time needed to get going. In fact, if you follow these ideas, you can be speaking in your community in a couple of weeks. Let me know how this works for you and enjoy it!